Fine Line Property Maintenance in Walworth, NY provides quality landscaping services to customers throughout the area at a price they can afford. Every job is completed on time and to the specifications of each customer. Regular lawn mowing not only adds aesthetic appeal to your outdoors spaces, it keeps your lawn healthy. Mowing your lawn weekly ensures debris does not accumulate in the grass and also removes certains pests from the grass. Keeping your grass at a uniform level also ensures your entire lawn receives an equal distribution of resources and grows evenly. We are proud to provide our customers with the highest quality workmanship. 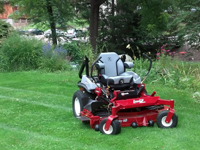 We work hard to maintain our equipment so your lawn always looks expertly manicured and maintained. In order to maintain tree health and stimulate growth, tree trimming is essential. This not only helps it retain its natural appearance, but helps minimize defects without damaging its growth. Our tree trimming services are meant to enhance the appearance of trees and your landscaping, while encouraging natural growth. Trimming services are performing on both mature and young trees to both remove dead and dying branches, as well as reduce the likelihood of failing branches in the future. 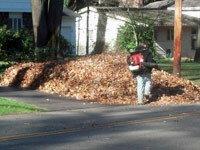 As part of your lawn maintenance program, we can provide leaf blowing and debris removal. This includes blowing out all landscaped areas and beds, and removing leaves, sticks and other debris from your lawn. Removing leaves and other debris from your lawn and landscaping ensures your grass and plants receive enough sunlight, nutrients and water. The soil next to sidewalks and driveways is the perfect breeding ground for weeds. This is because the soil is more compacted and warmer in these areas, which encourages weed growth. Our edging services can help your sidewalks and driveway look sharp. This service is typically performed in the fall because most weeds are not germinating between September to November. There are many benefits to adding mulch to your garden, flower beds, along the base of trees and in landscaping. Mulch helps soil retain moisture, regulate temperature, and reduce weed growth. In addition, it prevents soil erosion from water and wind. Proper mulching will reduce the amount of watering and weeding you have to do in your garden, as well as give it a more unified look. Together with you, we will help you determine which mulching type fits your needs. If you are looking to enhance the look of your outdoor spaces, we can help you choose the right plants, flowers, shrubs to fit your space. We are happy to work with you to explore how landscape improvements can add value and aesthetics to your home. One you have selected the plants, shrubs, or flowers you would like, we will provide you with planting services at your home. Like mulching, topsoil plays an important role in plant growth and health. Topsoil provides plants and flowers with the nutrients they need to survive and also provides plants with a place they can spread their roots. Adding mulch over topsoil creates an additional protective barrier which insulates the soil, helps control weeds, and increases water retention within the soil. Keeping your hedges and bushes shaped, trimmed and maintained keeps your outdoors spaces looking clean and appealing. In addition, it keeps your hedges healthy and in good condition throughout the year. Our goal is to encourage healthy growth in your bushes and to transform your outdoor spaces through regular trimming and pruning services. Western New York winters may be beautiful, but there is nothing worse than slipping, sliding and getting stuck in your own driveway. 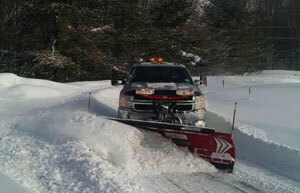 We are proud to provide snow removal services across Palmyra and Walworth. We are dedicated to providing efficient, effective snow removal services which allow you to enjoy winter without spending hours shoveling or worrying if your car will make it out of the driveway. For more information about any of our services or to discuss work you would like done, contact us today! We are proud to provide landscaping, property maintenance, and lawn services in Walworth, Palmyra, and surrounding communities. For more information about any of our services or to discuss work you would like done, contact us today!